Our new delicious ‘Sweet Treat’ themed tiny and small shapes are ideal for keyring charms, earrings, pendants for necklaces or as charms on bracelets. Choose from ice-cream, ice lolly, cupcake, French cupcake (customer drawing), gingerbread man, rings (doughnuts or polos), lollipop, sweetie or circle (for love hearts). Make wonderful gifts on their own or as part of a set – perfect for the summer! Choose from our selection of jump or split rings, add chain for necklaces – silver plated chain, snake chain or ball chain. Select silver plated earring hooks to turn you pendants into earrings as shown or choose silver ball chain, silver plated fine necklace chain or snake chain to create very unusual necklaces. Alternatively adhere a brooch back and make a brooch! 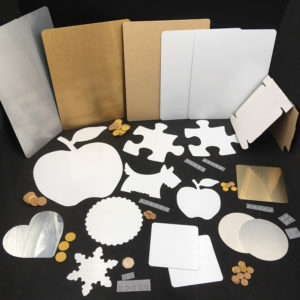 Machine cut in 0.5mm white as standard – all 8 other 0.5mm colours available Custom cut with a surcharge (choose custom cut colour listed and/or add to order notes as instructed). Choose none or one 3mm hole central. Also available – a selection of packaging to display your ‘Sweet Treats’ in style lol!